The DCPP (Double Center Press Platen) has greatly changed the concept of Clamping force. Center Press Platens of extremely low flexing are both the stationary and mobile sides. By evenly distributing surface pressure applied to the mold, the platens simultaneously eliminate center-lying burrs ,improve the cavity balance and enable molding at lower Clamping force than before. 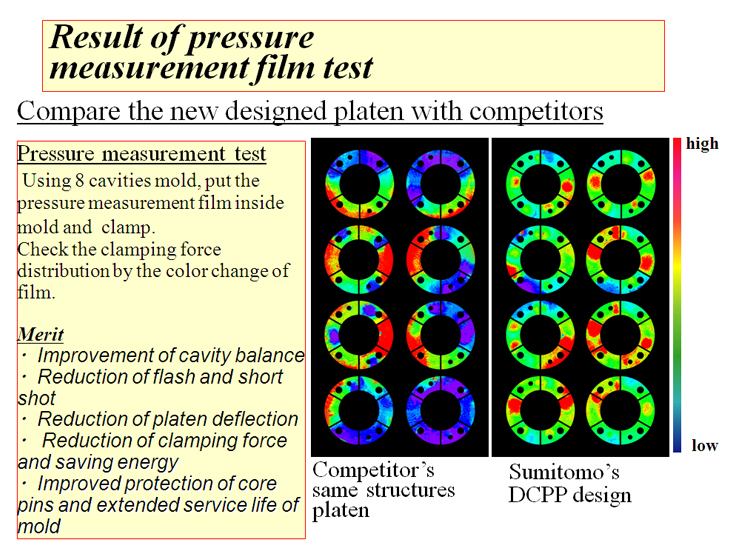 • CPP design reduces deformation of platen and mold. • It makes uniformity of clamping force distribution on the parting surface of mold. • It is able to reduce 20 to 40 % of clamping force without flash. 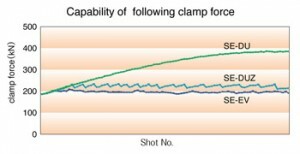 A new mold clamping mechanism improves the accuracy of clamp force detection. Because the actually measured clamp force is feed back to the machine, molding can be done at a stable clamp force without being affected by the thermal expansion of the mold.Futhermore,clamp force is kept at a stable clamp force is kept at a more stable level than was possible with earlier machines, even when working at low clamp force.